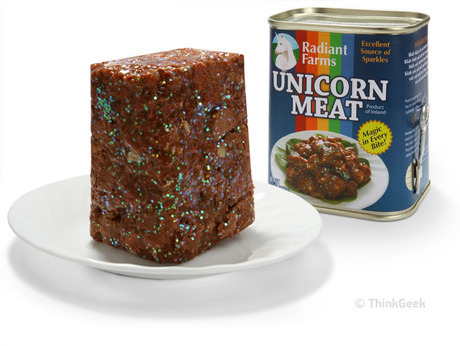 Internet shop ThinkGeek received a 12 page long cease-and-desist letter ordering them to take down one of their products – their sparkly “unicorn meat” pate. Not because unicorns don’t exist, or because it was offensive to mythology lovers or because people were getting the sparkles stuck in their teeth, but because the National Pork Board felt it ripped off one of their slogans.. “The Other White Meat”. The ThinkGeek entry proclaims Unicorn Meat is “The Other White Meat” and that slogan, I’ll have you know, has been trademarked by the Pork Board. See their blog about the Cease and Desist letter here..
See the Unicorn meat pagehere. They describe it: “Caviar is so 1980s. Unicorn is the sparkling, crunchy, savory meat of today’s elite.” Nom nom nom! The Pork Board does not realize that when people hear or read their slogan, they think “pork”, no matter who uses it …and being as this is ACTUALLY a pork product…what is their “beef”?